Indian Grey Hornbill (Most devoted husband in Avian world) with Lizard in beak. (1) To pick up fallen fruits from their beak . (2) To pick up mud pellets during the breeding season for sealing the cavity after the female has entered and settled into the cavity. (3) For hunting of insects ,birds or reptiles such as garden lizard or small snakes . Their presence in an area are indicators of large and long trees having hollow cavities. By no imagination you can call it a beautiful bird but has the most unique behaviour and characteristic which birders know. 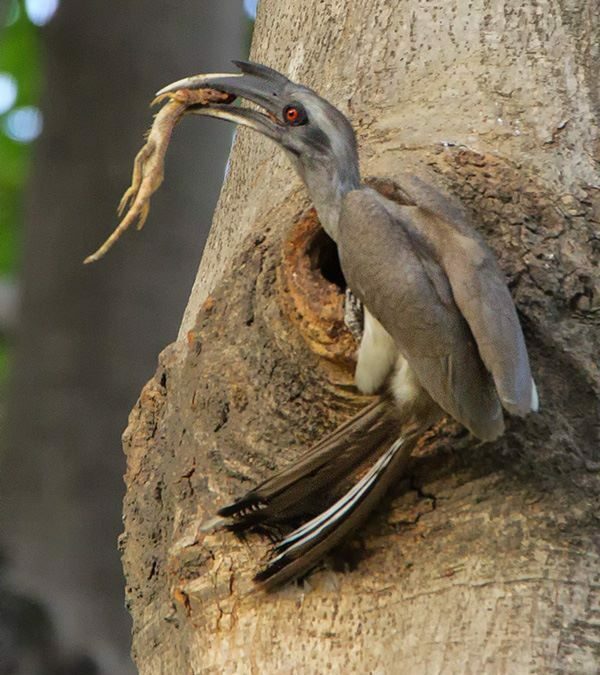 The male is the most devoted husband who feeds the female while she is inside the cavity for more than a period of 2 months . 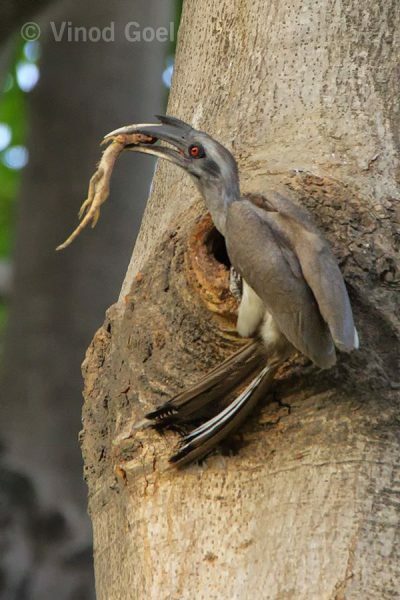 At the end of the breeding season when female is about to come out of the cavity, to supplement her diet I have observed male feeding the female ,garden lizard a number of times in a span of last 4 years. This was shot on 10th June 2016 in Delhi. The way I have been covering this bird for more than 4 years this specie appears to communicate with me . I am reminded of a very lovely song from the old Hindi film ANPADH (illiterate )….आपकी नजरों नें समझा प्यार के काबिल मुझे ,दिल की ऐ धड़कन ठहर जा, मिल गयी मंजिल मुझे .